Lane Electric Cooperative will need to inspect all ditches and conduit prior to back filling. Lane Electric will provide and install a service conductor. Please remember to call Utility Notification Center at (800) 332-2344 at least 48 hours prior to digging. Consumer will supply conductors long enough to be connected inside LEC’s transformer or secondary box. Maximum of 3 feet from pole to transformer or secondary box. Consumer will supply all trench, meter base, grounds, pole, and disconnect switch. LEC will connect the consumer’s wire to the transformer or secondary box and install the meter. Before you dig, call the Utility Notification Center at 811 or (800) 332-2344, 48 hours in advance. All electrical connections, equipment and equipment grounds shall comply with the National Electrical Code. 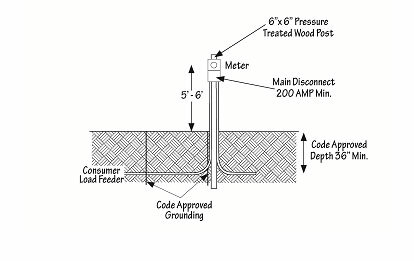 The Consumer shall furnish and maintain a 6-inch by 6-inch x 10-foot pressure treated wood post, all conduit, conduit straps, grounds, meterbase, disconnects, and electrical cable beyond the meter, and shall open and backfill a service trench 36-inch minimum depth from the Lane Electric’s equipment to the desired meterbase location. The Cooperative shall furnish and maintain the meter and electrical cable from Lane Electric’s equipment to the meter. Before the cooperative energizes the meterbase, the base must be inspected and approved by the State or City Electrical Inspectors and the cooperative personnel. The service trench must be completely backfilled. 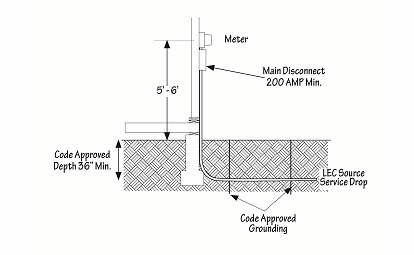 The consumer shall furnish and maintain all conduit, conduit straps, grounds, meterbase, disconnects, and electrical cable beyond the meter, and shall open and backfill a service trench 36-inch minimum depth from Lane Electric’s equipment to the desired meterbase location. The Cooperative shall furnish and maintain the meter, electrical cable from Lane Electric’s equipment to the meter. Before the cooperative energizes the meterbase, the base must be inspected and approved by the State or City Electrical Inspectors and the cooperative personnel. 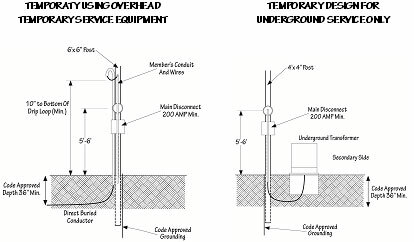 The service trench must be completely backfilled after approved inspection.